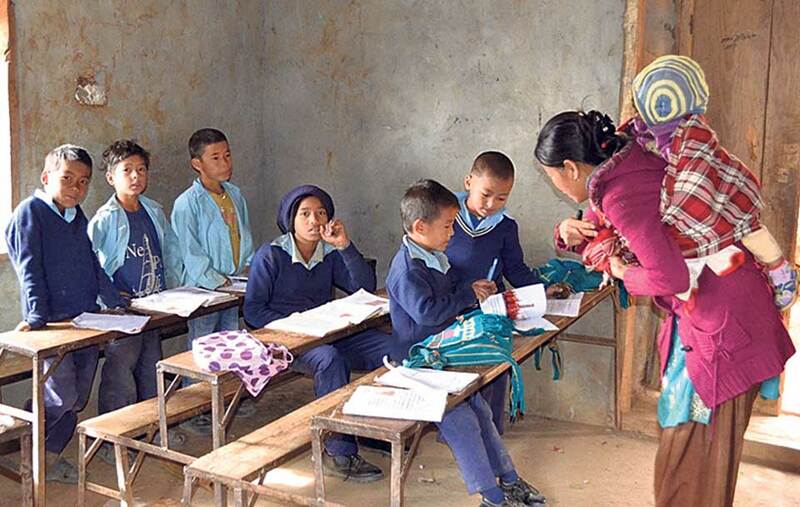 ROLPA, Nov 28: Of the 407 community schools in Rolpa, 232 do not have even a single government teacher’s quota and only a very few of the schools have proper building or classrooms. In the lack of such resources schools here are operated in a pathetic condition that is affecting the education of thousands of children. Locals feel that the government has not paid adequate attention to the ‘remote Rolpa’. Even after adopting the federal setup, locals claim that there has been no visible change in the education apparatus of the district. “Our children are still deprived of getting an education in good schools. We are poor and the government is yet to consider this reality,” said a local of Kotgaun, Dinesh Budha. Among the 407 community schools in the district, 101 primary, 67 lower secondary and 64 secondary level schools don’t have even a single quota for a government-appointed teacher. In the remaining schools too, the government has not allocated the required quotas of teachers. Finding a well-run community school in this district is a daunting task. “We are finding it very hard to operate the school. It feels very sad to say so, “ said Gharti. Keshar Bahadur KC, principal of Jalaupokhari Secondary School says his school is on the verge of closure. “We are succumbing to poverty and crunch of resources’ he noted. The school pays around Rs 80,000 to teachers monthly. The government does not share the burden. And paying that hefty amount is now becoming ‘impossible’ for the school to manage. “We have decided to quit. There is no other way. There are no resources; there is no government quota for teachers. We don’t have anything to rely on for paying our teachers,” said KC. The salary amount is being provided through school fees. But this has gradually taken a toll on students’ number. Every year, the school is losing its students. “And sadly, students are not leaving us for joining a better school, but instead they are dropping out to assist their parents in their work,” said KC. Schools cannot charge fees to students as they want. According to KC, it is only during the admission time, schools make some money. Though the government has promised ‘free admission’, community schools have been charging a certain amount as admission and re-admission fees to new as well as old students respectively. “But like private schools, we cannot charge students on a monthly basis. Only on some occasions, we request parents to support us,” said KC. Hari Dangi, principal of Namli Lower Secondary School, said that teachers are not happy with the salaries they are paid at the school. Monthly, the school pays a total of Rs 45,000 to teachers. “We collect some money as admission fee at the start of the new session. We deposit in a bank and cover our annual expenses,” said Dangi. “But now we don’t have any balance left in our bank account for paying their salaries. We are worried.” School teachers and principals in Rolpa have urged the government to increase teacher’s quota. If salary is paid by the government, the school can handle the rest of the expenses on its own, they state. As per the record, teachers’ quota in Rolpa is less by 60 percent. “The government must be serious to fill this gap,” said Dangi. He stated that the local government must take interest on the matter and come up with some solution to address the problem. As per the Rolpa District Education Office, there are around 90,000 school students in the district.